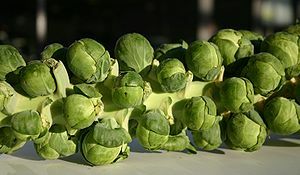 Our farmer’s markets are definitely in winter mode. At the NC Farmer’s Market, many farmers who feature summer crops are gone and have been replaced with Christmas tree and firewood vendors. Our weekend markets have reduced their hours because, really, who wants to get outside at 8am when it is 30 degrees outside to score some fresh kale. Not me, that’s who. 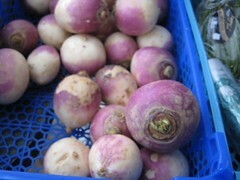 Even though the markets have lost their summer bounty and a bit of their festive air, they are still full of goodness! I’m not sure who invented the crock pot, but I love them. I mean, I enjoy getting in the kitchen and cooking, but there is something magic about putting ingredients in a crock pot in the morning and coming home from work to find something wonderful…and finished! And while I find stirring risotto to be soothing, standing around cooking apples doesn’t have the same appeal to me. Not sure why, but there it is. 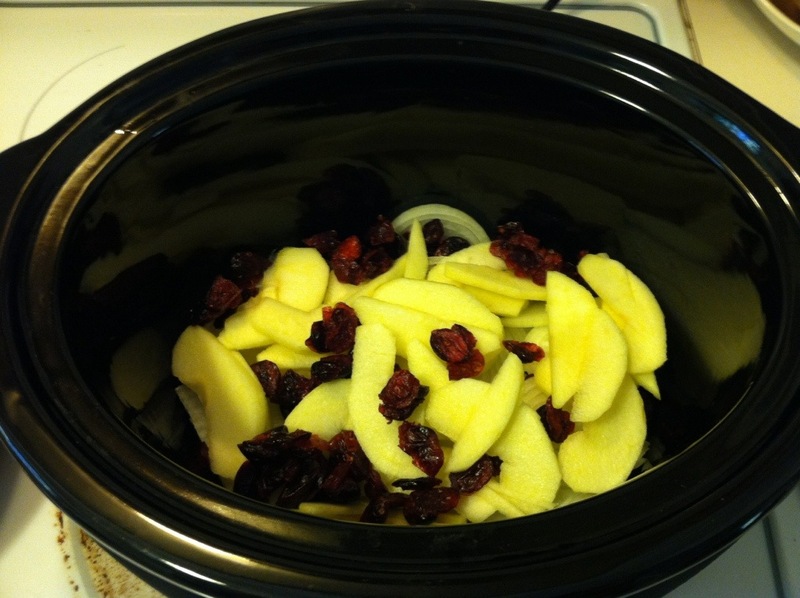 So I am loving this crock pot applesauce recipe that came with my Produce Box this week. I’m not a huge fan of cold applesauce, but I do love it warm. And mix it in with some steel cut oatmeal and I feel like I’m wearing a warm, fuzzy Snuggy all morning long. Except people aren’t rolling their eyes at me. I think it would be great with the Maple Oatmeal Bread from Sugar Dish Me also (note to self: stop dreaming about this bread and make it already). You can alter the sugar and spices (I added clove to mine) to suit your taste. This recipe makes about 8 cups of sauce–enough to eat now and freeze some for another day! Put sliced apples (I leave the skins on–more fiber is never bad, right?) in a large bowl. Sprinkle lemon juice over the apples. Mix sugar and spices together in a small bowl and sprinkle over apples. Using a spoon or your very clean hands, toss the apples and the spiced sugar together until coated well. Put all in your crock pot. Cook on low for 6 hours or high for 3 hours. Mash with a potato masher for chunky sauce or use an immersion blender (careful–sauce is hot!) to blend all together. Store in refrigerator for up to 5 days or freeze in freezer bags to enjoy up to 1 year later. Tomorrow is the first official day of fall and in spite of all the hot weather we had this summer, it looks like fall produce is right on cue! Peaches and berries are a memory and more hearty vegetables like sweet potatoes and squash are here in earnest. Also, many savvy farmers have jams, jellies and fruit butters made from their summer produce. If you can’t (or don’t want to) make your own, buying local jams and jellies is a great way to eat local and support your farmers all year long! Fall is still a great time to explore your farmer’s market so get out there and happy shopping! 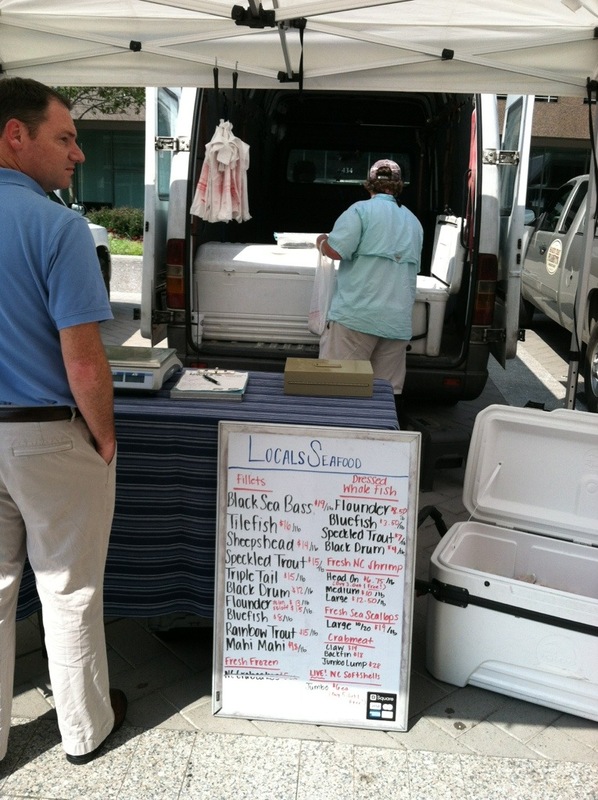 We still have fresh seafood at our farmer’s markets–yay! One of my favorite summer dinners is tomato sandwiches. Or ‘mater sandwiches. However you say it, I think they are summer perfection. I do make a tarted up version of the ‘mater sandwich, which is supposed to consist of soft white bread, tomato slices, mayonnaise and salt/pepper. We don’t eat white bread and I can’t handle the thought of a tomato sandwich on wheat (that is just wrong, people), so my compromise is fresh sourdough, regular (not low-fat) mayo, fresh, heirloom tomatoes, salt and pepper, some chopped rosemary from the garden and a slice of provolone cheese. I could eat these sandwiches every day. I LOVE them and consider them a staple of summer. As a matter of fact, I ate tomato sandwiches (yes, plural) just before going into labor with Ellie, so maybe they have a special place in my heart.